iotakorea.net 는 IOTA의 기술과 관련된 Use case를 다루며 특별히 아래 2가지 주제를 함께 다룹니다. IOTA is a next generation public distributed ledger that goes beyond regular blockchain by deploying an entirely new architecture based on directed acyclic graph (DAG) called Tangle. The IOTA protocol get rid of fees, scaling and centralization issues that have plagued blockchain since incarnation. In the Tangle ledger every user is also a validator, giving rise to an entirely self-regulating maximally decentralized network. This makes it an ideal transmission platform for ensuring and distributing data with tamper proof guarantee. IOTA was founded by blockchain pioneers David Sønstebø, Sergey Ivancheglo, Dominik Schiener and Serguei Popov and is already recognized as the world leader in Internet-of-Things, as well as being ranked top 5 crypto only 2 months after release. IOTA is developed by the non-profit open source IOTA Foundation with headquarters in Germany and Norway. IOTA는 Tagle이라고 불리는 Directed Acyclic Graph(DAG)를 기반으로 하는 완전히 새로운 아키텍처로 기존의 블록체인을 뛰어넘는 차세대 퍼블릭 분산 원장입니다. IOTA프로토콜은 블록체인이 갖고 있는 수수료, 스케일링, 중앙 집중화 문제들을 해결하였습니다. Tangle 원장에서는 모든 사용자가 벨리데이터로서, 높은 수준으로 분산화된 네트워크에서 완전한 자기 규제 구현이 가능합니다. 이를 통해 외부 간섭을 차단하여 데이터를 완전하게 보호하고 배포하기 위한 이상적인 전송 플랫폼이 될 수 있습니다. IOTA는 블록체인 선구자인 David Sønstebø, Sergey Ivancheglo, Dominik Schiener and Serguei Popov에 의해 설립되었고, 발표된 지 불과 2개월 만에 상위 5위의 암호화 화폐에 랭크될 정도로 모든 사람들로부터 신뢰를 얻었습니다. 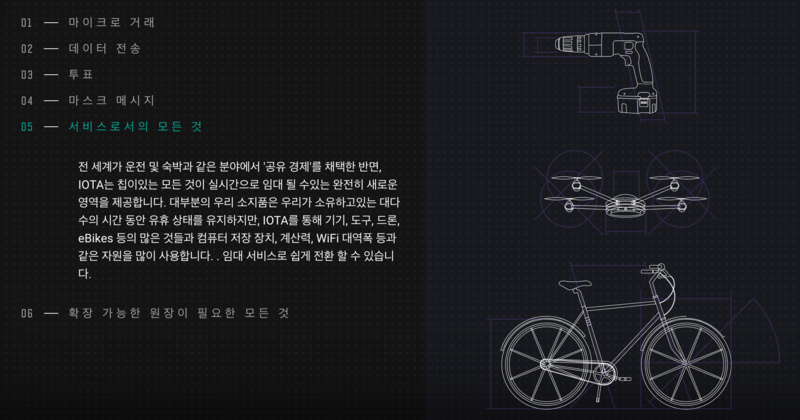 IOTA는 독일과 노르웨이에 본부를 둔 비영리 오픈 소스 IOTA Foundation에 의해 개발되었습니다.